You may have noticed that it’s “Infrastructure Week” in America — a time where engineering and construction industry groups beat the drum for more money, using big numbers and images of collapsing bridges. It’s hard to dispute the value of infrastructure, or that America’s transportation, water, sewer, and utility systems are generally in bad shape. But the big prescription that comes out of Infrastructure Week is not so much about making better infrastructure — it’s mainly about spending more money. 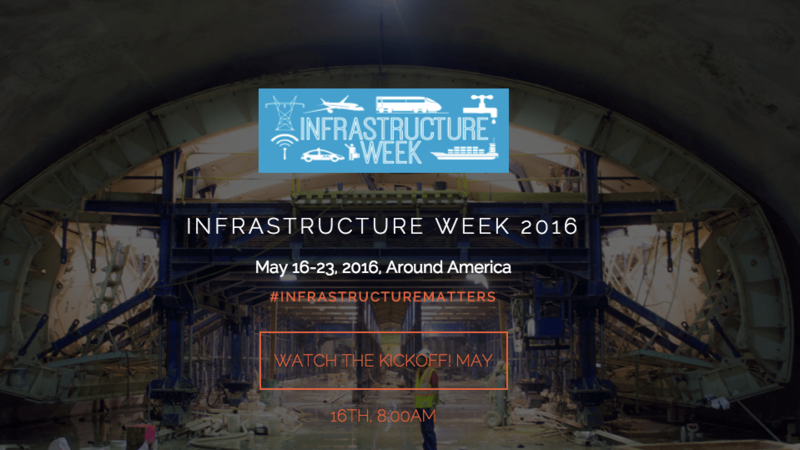 Infrastructure Week is brought to you by some of the largest engineering firms in the world. The coalition is broader than that, and includes some perspectives that emphasize quality and efficiency. But the driving force is the American Society of Civil Engineers, an organization with plenty of self-interest in bigger public construction budgets. So it’s no wonder that the message from Infrastructure Week boils down to an orchestrated appeal for funds. It’s also not difficult to see why this message doesn’t get a lot people very excited: For more money, we can get a less defective version of what we’ve already got. In its latest report [PDF], ASCE paints a dire picture of a future in which the public doesn’t wise up and see how much they need more infrastructure spending, especially on surface transportation. If an additional $1.1 trillion for surface transportation isn’t spent by 2040, ASCE warns, it will cost America $3 trillion in unrealized gross domestic product. The total miles of U.S. pavement rated mediocre or poor (pavement roughness index 170 or higher) has been reduced by 17% in six years. The number of bridges considered structurally deficient has been reduced to 10% in 2014, showing a 14% decrease over six years. Despite the improving condition of roads and bridges, ASCE still says we’re headed for trouble due to “a failure to significantly invest in capacity growth.” In other words, highways are getting clogged by car traffic. But if there’s one thing we’ve learned about infrastructure spending in the past 60 years, it’s that road widenings are a terrible use of money. The cumulative effect: Road lobbyists are duping reporters and regular people into pestering Congress for road expansion funds. To be sure, some people are taking the opportunity to ask the infrastructure policy questions we should be worrying about in the 21st Century. Are we making efficient use of the infrastructure funds we have? How can our infrastructure investments address pressing challenges like climate change or the housing crunch in major American cities? But ASCE and other players with huge marketing budgets and a media megaphone are lagging behind, turning Infrastructure Week into a plea to make highways great again. Loved the end of Angie’s last sentence! It’s also worth using infrastructure week to ask why it seems that we pay significantly more for infrastructure projects that take significantly longer (see, e.g. http://theweek.com/articles/449646/why-expensive-build-bridge-america) than other comparable countries. It becomes increasingly hard to get the public to support new projects when they see the old ones mired in cost overruns and delays. do they also sell used cargo bicycles ? It’s very unfair to say that ASCE is focused solely on highway growth. Specifically, Angie missed the remainder of the quoted statement – “a failure to significantly invest in capacity growth” – with the remainder of the sentence, “across all modes of transportation”. Most of the infrastructure report is devoted to water, electricity, and ports (sea and air) with surface transportation just one of the components. ASCE has for the past few years been clear in its support of Complete Streets – http://www.asce.org/issues-and-advocacy/public-policy/policy-statement-537—complete-streets/ – public transportation – http://www.asce.org/issues-and-advocacy/public-policy/policy-statement-494—public-transportation/ – and bicycle facilities – http://www.asce.org/issues-and-advocacy/public-policy/policy-statement-436—incorporating-bicycle-facilities-into-transporation-planning-and-design/ . While this may have not been the case years ago, civil engineers are recognizing the impact that unsustainable infrastructure has on the economy and environment, and through initiatives like the ASCE Grand Challenge (http://www.asce.org/Grand-Challenge/) are innovating for solutions that will be fiscally and environmentally sustainable for decades to come. Is Infrastructure Spending Good for the Economy? It’s Complicated. Infrastructure spending produces a net economic benefit for society only if the project benefits exceed the costs.